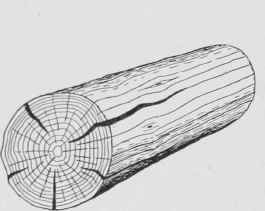 Another defect which is caused by the drying out of the timber and the consequent shrinkage of the cell walls is what is known as checking. 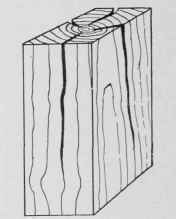 In any log of wood there is always opportunity for shrinkage in two directions, along the radial lines following the direction of the medullary rays, and around the circumference of the log following the direction of the annual rings. 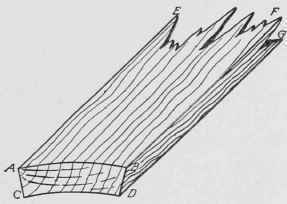 If the wood shrinks in both directions at the same rate, the result will be only a decrease in the volume of the log, but if it shrinks more rapidly around the circumference of the log than along the radial lines, the log must develop cracks around the outside as shown in Fig. 9. Such cracks are called checks. 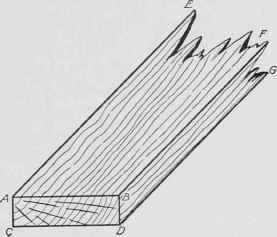 In timber which has been prepared for the market they show themselves in the form of cracks which extend along the faces of solid squared timbers and boards, seriously impairing their strength. Fig. 10 shows checks as they would appear in a square post or column. Fig. 9. Log Showing Checks. Fig. 10. Finished Timber Showing Checks.